Laws that are meant to govern the landlords and tenants for each state, can differ greatly depending on the area or the state one is in. It is important to read through ever article concerning landlord and tenant laws for your state, especially if you intend to rent or be a renter at any point. This article is only a list of guidelines as outlined in the official Kansas Landlord and Tenant Act, restated for clarity and purpose. It is not meant to serve, in any way, as a replacement of the law. Each reader is responsible for their own outside research. Stay up to date on Kansas Landlord Tenant Laws + Save money on tenant screening and other property management needs. Join AAOA today, it’s FREE! Tenants are naturally required by law to do a lot of different things. These are explicitly outlined in the Landlord and Tenant Handbook of Kansas. Before beginning to rent, all tenants are responsible for filling out their own rental applications and doing their own research. If a tenant has a disability that should be stated in the rental application and it should be explicitly discussed in order to be accommodated. Tenants are absolutely required to pay their rent on time. Exceptions can be made, but that must be agreed upon by both parties and the reasons for lateness must be approved by the landlord in writing before it is technically valid. Determine who is responsible for utilities. If the tenant is responsible they are required to pay them on time. Tenants are not allowed to have more people living in the unit unless they are previously passed by the landlord. Any new move-ins should be discussed with the landlord beforehand. The yard must be kept clean and free of debris and damage. The unit must also be kept up, maintenanced and free of clutter and trash. If a tenant is going to be leaving for an extended period of time, they must let their landlord know. This can help prevent the unit from being declared abandoned and rented to someone else. Tenants must all damages and dangers to the landlord immediately. Follow every policy as stated in the rental agreement. Do not alter the property or rental unit without the permission of the landlord. This can include painting, flooring, room renovation etc. Tenants are responsible for the behavior of their guests while on the property. Be courteous of others. Tenants may also be responsible for their roommates, and it is important to choose roommates who are going to keep their end of the responsibility. Unpaid rent will almost always drop to the other roommate. Just as there are many rules governing the tenants, there are also quite a few that govern the landlords as well. Here are some of the rights and responsibilities both before a tenant and during a tenancy. Take note of the tenant’s vehicle count and be sure to arrange appropriate parking for their vehicles. If they have a lot of cars, discuss it beforehand. Landlords must follow all rules in complete compliance with the Kansas Landlord and Tenant Act. This includes all building and housing, city and county ordinances that are exclusively stated. Any common areas between tenants should be maintained and up kept by the landlord. This includes laundry facilities (if available), hallways, parking lots and yards. If a landlord does not keep these areas maintained, they must ensure someone is hired to do so. Heat must be supplied during the winter as well as air conditioning in the summer. Landlords must supply working smoke detectors. Hot and cold water must be in adequate supply and must be maintained. All electric, plumbing, heating, wiring, etc should be maintained to be safe and free of all immediate danger. The building should be safe to live in. Trash removal must be available, even if it is offered from an outside source. If the rental unit contains any working appliances, those must be maintenanced free of charge to the renters. They must also be kept safe. All landlords must make accommodations for disabilities if the need is there. As like most rental laws, there are two general types of leases in the Kansas tenant laws. There are either written or verbal and either month-by-month or yearly. This can just depend on the area, the rental unit and the individual landlord. There are lots of things to consider about these as well. If you participate in a verbal agreement, they usually tend to last month to month unless stated up front. Sometimes they can be every two weeks if previously agreed upon. Although written agreements are not required they are oftentimes highly recommended. Written agreements are much more clear, concise and binding and they help eliminate any disagreements about the renting in the future, especially when you rent for long periods of time. Unless it is discussed previously, the rent should be due at the first of every month. This is something that should be discussed and agreed upon in writing to prevent misunderstanding. Tenants should always request paid receipts from their landlord. It is up to the landlord whether they wish to prorate the unit if it is rented during the middle of a term or not. A written record detailing the condition of the premises should be provided upon move in. Tenants should document it themselves just to keep discrepancies from arising. If two tenants decide to be roommates to one rental unit, it is suggested that they have separate rental agreements to sign. Anything unclear must be answered by the landlord when asked. The name of all tenants as well as the address of the rental unit. Checklist of who is responsible for what issue if it happens to arise. The Federal Fair Housing Act for the United States, discusses and outlines the illegality of discriminating in any way toward individuals or families for any prejudice reason. They are not allowed to deny rent or make odd changes to their housing policies due to any sort of discriminatory act. Security deposits act as a sort of down payment that secures a tenant’s place in a rental unit. They are usually a flat rate of some kind, or the landlord can set their own rates, however in Kansas the law states that the security deposit cannot be higher than monthly rent. The only exception is when the tenant has a pet. These deposits are often used for damages that occur to the unit or for missed rental payments. If a tenant maintains the unit and upholds their payments, the security deposit is often returned at the end of their tenancy. These expectations should be outlined in the rental agreement. Termination and eviction are circumstances that most landlords and tenants try to forget about and do not want to face. However, these issues are real ones and if they arise it is very important to know what the law says, in order to better be able to handle it. Here are the laws specific to Kansas. Sometimes, tenants have circumstances that may arise where they have to break their lease prematurely. This can be for any number of reasons, but it is important that work something out with their landlord. These circumstances are allowed, but sometimes the tenant will lose their security deposit return if this happens to be the case. The landlord is required to give the tenant a proper eviction notice of up to 3 days depending on the situation and circumstances. At that point, the eviction process should be established between both the tenant and landlord. For a non-payment eviction, a written notice of ten to fourteen days is required. Severe or repeated instances of interfering with the rights of others. Repeated damages to the rental unit or premises. Only a police officer can physically evict a tenant. In order for a forcible eviction to take place, the landlord must first warn the tenant in writing, take the issue to court, and get judgment against the convicted tenant before actions can take place. Landlords may not forcibly evict by throwing out the tenant’s belongings, cutting of utilities or locking them out. If any of these take place, the tenant can call law enforcement and file charges against the landlord. A key component of landlord tenant laws is also Kansas Tenant Screening Background Checks. We’ve dedicated an entire page to it because of its importance. Visit Kansas Tenant Screening Background Checks to screen your tenant. All states require a variety of forms to rent an apartment to a tenant and Kansas is no exception. Check out American Apartment Owners Association’s Kansas Landlord Forms now. Looking for landlord tenant laws outside of Kansas? The American Apartment Owners Association offers helpful landlord tenant laws for all 50 states. Click on any of the states listed below and go directly to its landlord tenant law page. To visit the homepage of landlord tenant laws, click here. 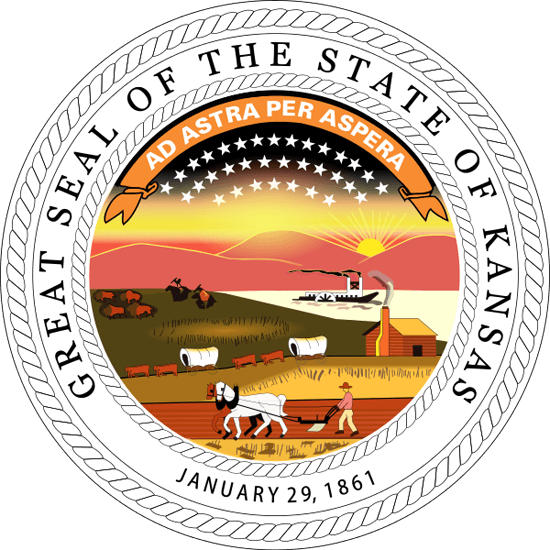 To get other information about rules governing Kansas tenants and landlord laws, view the Kansas Landlord and Tenant Act. For more legal information about Kansas landlord laws, visit the HUD. To file a complaint against a landlord or a tenant, or to report a crime in your area, visit the Kansas Attorney General Website. For other information regarding laws for landlords, view the Landlord and Tenant Handbook.